The stamped inscriptions on this ivory dial are filled with red and black colours. Two brass clasps allow the dial to be closed, one clasp attached to the opposite side would hold the dial in position while being used. A pivoted arm on the side edge of the lower leaf covers a cavity. The dial is decorated with geometrical patterns and leaves. The outer surface of the upper leaf contains a windrose with 16 directions in German and the names of eight winds in Italian: 'TRAMONTA GRECO LEVANTE SIROCHO OSTRO LEBECHIO PONENTE MASTRO'. Outside the windrose are the directions of the rising and setting of the sun and midnight and midday indicated as 'AVFGANG MITTAG NIDERGANG MITTERNACH'. A circular cutout in the nothern part of the windrose allows the compass needle in the lower leaf to be seen and at the same time provides space for the plumb bob on the inner surface. The inner surface of the upper leaf contains a vertical string gnomon dial with the hours numbered anticlockwise 6 to 12 to 6. The centre of the dial is decorated with the sun's face from which a plumb bob is suspended which is housed in the above described cutout. Above and below the dial are the date and signature given as '1578' and 'PAVLVS REINMANN ZV NORMBERGE FACIEBAT'. The inner surface of the lower leaf contains a horizontal string gnomon dial with the hours numbered clockwise from 4 to 12 to 8. The compass in the centre is a replacement and contains a compass card signed 'E. Ch. 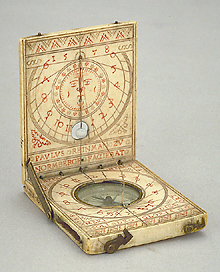 Stockert', an 18th century German sundial maker. Outside the dial the cardinal directions are given in Latin, as well as the motto 'SOLI DEO GLORIA'. The outer surface of the lower leaf is empty except for the maker's mark, a crown, stamped twice. The instrument was given by A.W. Franks in 1871 and is described in F. A. B. Ward, A catalogue of European Scientific Instruments in the Department of Medieval and Later Antiquities of the British Museum (London, 1981), p. 35, no. 78.